• B1 - The Olympic parties or their representatives shall not, directly or indirectly, solicit, accept or offer any form of remuneration or commission, nor any concealed benefit or service of any nature, connected with the organization of the Olympic Games. • B2 - Only gifts of nominal value, in accordance with prevailing local customs, may be given or accepted by the Olympic parties, as a mark of respect or friendship. Any other gift must be passed on to the organization of which the beneficiary is a member. • B3 - The hospitality shown to the members and staff of the Olympic parties, and the persons accompanying them, shall not exceed the standards prevailing in the host country. • B5 - The Olympic parties shall use due care and diligence in fulfilling their mission. They must not act in a manner likely to tarnish the reputation of the Olympic Movement. • B6 - The Olympic parties, their agents or their representatives must not be involved with firms or persons whose activity or reputation is inconsistent with the principles set out in the Olympic Charter and the present Code. • Article 2 - A situation of a potential conflict of interests arises when the opinion or decision of a person, acting alone or within an organization, in the framework of the activities of the physical or legal persons defined in Article 1 above, may be reasonably considered as liable to be influenced by relations that the aforementioned person has, has had or is on the point of having with another person or organization that would be affected by the person’s opinion or decision. • Article 3 - Personal and/or material involvement with an organization liable to benefit from the assistance of the Olympic party concerned (including subsidy, approval clause or election). • Article 4 - It is the personal responsibility of each person to avoid any case of conflict of interests. Faced with a situation of a potential conflict of interests, the person concerned must refrain from expressing an opinion, from making or participating in making a decision or accepting any form of benefit whatsoever. Between 2002 and 2008, Robert Eringer served as Prince Albert’s intelligence advisor and established and directed the Monaco Intelligence Service with the specific charge to root out corruption in the Principality. In this capacity and through his investigations, Mr. Eringer became aware of and tried to combat a growing invasion of Russian organized crime and corrupt officials pouring into Monaco and influencing its politics. Through his intelligence operatives, Mr. Eringer learned that Russian intelligence services had profiled Prince Albert and devised a plan to place or compromise key people within Prince Albert’s friends and advisors with the aim of influencing and directing his decision making. Indeed, several of Prince Albert’s aides and advisors have developed Russian business interests. See Exhibit A. Particularly, Mr. Eringer warned Prince Albert about Sergei Pugachev, a Russian senator and banker, sometimes referred to as the “cashier to the Kremlin” and a close friend of Vladimir Putin. Mr. Pugachev was trying to cultivate personal and business ties with Prince Albert in addition to purchasing Monegasque nationality. Intelligence sources and Monaco police had determined Mr. Pugachev was linked to Russian organized crime and Mr. Eringer warned Prince Albert of this fact. See Exhibits A and B. Soon after warning Prince Albert about Russian designs on him, in April 2006, Prince Albert engaged in an expedition to the North Pole and accepted Russia’s offer to organize and provide logistical support for the trip. At the end of the expedition, Vladimir Putin hosted Prince Albert for a state dinner at the Kremlin. Prior to the trip, Mr. Eringer drafted a memo to warn Prince Albert that Russian intelligence would keep him under surveillance and that if he engaged in intimate socializations with men or women, it would likely be video-recorded and used to influence him. The potential of Russian intelligence obtaining a video of Prince Albert’s intimate relations concerned Mr. Eringer because he had obtained reports from other foreign intelligence agencies who had surveillance of Prince Albert having intimate socializations with men and women. See Exhibits A, C and D.
Following the expedition, Prince Albert accepted a magnificent gift from Russia, a three-bedroom “dacha” (a Russian term for a second home) to be built on Prince Albert’s private farm known as Roc Agel located in the mountains behind Monaco. Russian paid for the construction and supplied Russian laborers. Construction commenced in early 2007 and was completed in 2008. See Exhibits A and E.
In July 2007, the IOC held its meetings in Guatemala City, Guatemala where Sochi, Russia was selected to host the 2014 Winter Olympic Games. 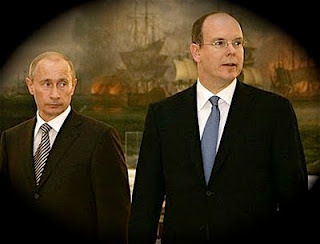 Following the IOC meeting, in August 2007, Mr. Putin invited Prince Albert to Russia for a fishing trip. The trip was widely covered in the media and described as a “thank you” for Prince Albert’s support of the Sochi, Russia Olympic bid. See Exhibits A, F, G and H.
Having accepted lavish gifts and trips from Mr. Putin and Russia before and after voting in favor of the Sochi Olympic hosting bid, Prince Albert has continued to closely associate with Mr. Putin’s close friend, Kremlin banker and organized crime suspect Sergei Pugachev. As recently as 30 July 2010, Prince Albert invited Mr. Pugachev as his guest of honor to sit with him at the head table at the annual Red Cross Gala, one of the most important and high profile social events in Monaco. Russian authorities are currently investigating why several billions of dollars have disappeared from Mr. Pugachev’s bank (but a spokesman for the bank states that Mr. Pugachev is still close to Mr. Putin). See Exhibits I and J. Prince Albert’s conduct described above violates several provisions of the IOC’s code of ethics and rules on conflicts of interest. A. B1 - The Olympic parties or their representatives shall not, directly or indirectly, solicit, accept or offer any form of remuneration or commission, nor any concealed benefit or service of any nature, connected with the organization of the Olympic Games. During the campaign to host the 2014 Winter Olympic Games, Prince Albert accepted from Russia assistance for his North Pole expedition, a state dinner at the Kremlin hosted by Prime Minister Vladimir Putin, and a three bedroom dacha built on Prince Albert’s private estate by Russian laborers. Immediately after the vote awarding the games to Sochi, Russia, as a “thank you” for his support of the Sochi bid, Prince Albert accepted from Russia’s prime minister a fishing vacation in Siberia. These gifts accepted by Prince Albert were remuneration and benefit “connected with the organization of the Olympic Games” in violation of rule B1. B. B2 - Only gifts of nominal value, in accordance with prevailing local customs, may be given or accepted by the Olympic parties, as a mark of respect or friendship. Any other gift must be passed on to the organization of which the beneficiary is a member. B3 - The hospitality shown to the members and staff of the Olympic parties, and the persons accompanying them, shall not exceed the standards prevailing in the host country. Common judgment and discretion should have alerted Prince Albert that the extravagant and expensive gifts of a polar expedition, fishing vacation, state dinner and a three bedroom dacha exceeded the guideline of rule B2 which says only “gifts of nominal value, in accordance with prevailing local customs” may be accepted by an IOC member. Likewise, Prince Albert should have known that the hospitality shown him by Russia and Vladimir Putin “exceeded the standards prevailing in the host country” in violation of rule B3. C. B5 - The Olympic parties shall use due care and diligence in fulfilling their mission. They must not act in a manner likely to tarnish the reputation of the Olympic Movement. D. B6 - The Olympic parties, their agents or their representatives must not be involved with firms or persons whose activity or reputation is inconsistent with the principles set out in the Olympic Charter and the present Code. In 2006, at the time Vladimir Putin was seeking favor with Prince Albert by supporting his North Pole expedition and hosting a state dinner at the Kremlin, Prince Albert was also developing a relationship with Mr. Putin’s close friend, Sergei Pugachev. Mr. Eringer’s intelligence sources and Monaco’s police files confirmed Mr. Pugachev’s ties to Russian organized crime. Mr. Eringer warned Prince Albert of Mr. Pugachev’s reputation and counseled him to shun Mr. Pugachev. Despite Mr. Eringer’s warnings, Prince Albert has continued to associate with Mr. Pugachev. A demonstration of their closeness occurred on 30 July 2010 when Prince Albert invited Mr. Pugachev to be his guest of honor and to sit at the head table at the annual Monaco Red Cross Gala. Mr. Pugachev’s operation of his Russian bank is currently under investigation. By closely associating with Mr. Pugachev, Prince Albert is involved with a person “whose activity or reputation is inconsistent with the principles set out in the Olympic Charter and the present Code” in violation of rule B6. A. Article 2 - A situation of a potential conflict of interests arises when the opinion or decision of a person, acting alone or within an organization, in the framework of the activities of the physical or legal persons defined in Article 1 above, may be reasonably considered as liable to be influenced by relations that the aforementioned person has, has had or is on the point of having with another person or organization that would be affected by the person’s opinion or decision. By accepting Russia’s assistance for his North Pole expedition, a state dinner at the Kremlin hosted by Prime Minister Vladimir Putin, and a three bedroom dacha built on his private estate paid for and built by Russian laborers during Sochi’s campaign to host the 2014 Winter Olympic Games, Prince Albert was in “a situation of a potential conflict of interest” as he “may be reasonably considered as liable to be influenced” by that relationship in violation of Article 2. B. Article 3 - Personal and/or material involvement with an organization liable to benefit from the assistance of the Olympic party concerned (including subsidy, approval clause or election). The potential conflict of interest described in Section A above, in addition to Prince Albert’s ties with close Putin friend and organized crime suspect Sergei Pugachev, made Prince Albert personally and materially involved with Sochi’s Olympic hosting bid which would benefit from Prince Albert’s approval vote in violation of Article 3. C. Article 4 - It is the personal responsibility of each person to avoid any case of conflict of interests. Faced with a situation of a potential conflict of interests, the person concerned must refrain from expressing an opinion, from making or participating in making a decision or accepting any form of benefit whatsoever. Faced with his conflict of interest, Prince Albert should have refrained from participating in the venue selection for the 2014 Winter Olympic Games. Instead, Prince Albert voted to award the games to Sochi, Russia in violation of Article 4. The above recitals demonstrate Prince Albert’s bold and egregious violations of the IOC’s Code of Ethics and rules on conflicts of interest. Indeed, the facts show that Prince Albert acted with impunity and without fear of consequence. Mr. Eringer stands ready to cooperate with any IOC investigation and to provide further testimony and evidence as requested. To protect the integrity of the Olympic movement, we hope that the IOC and its Ethics Commission will fully investigate this matter and punish the offenders to dissuade others from conducting themselves like Prince Albert. If this matter is not investigated, future selections of Olympic host cities by the IOC will no longer be a competition on the content of potential host city bids, but rather a contest to bribe IOC members.